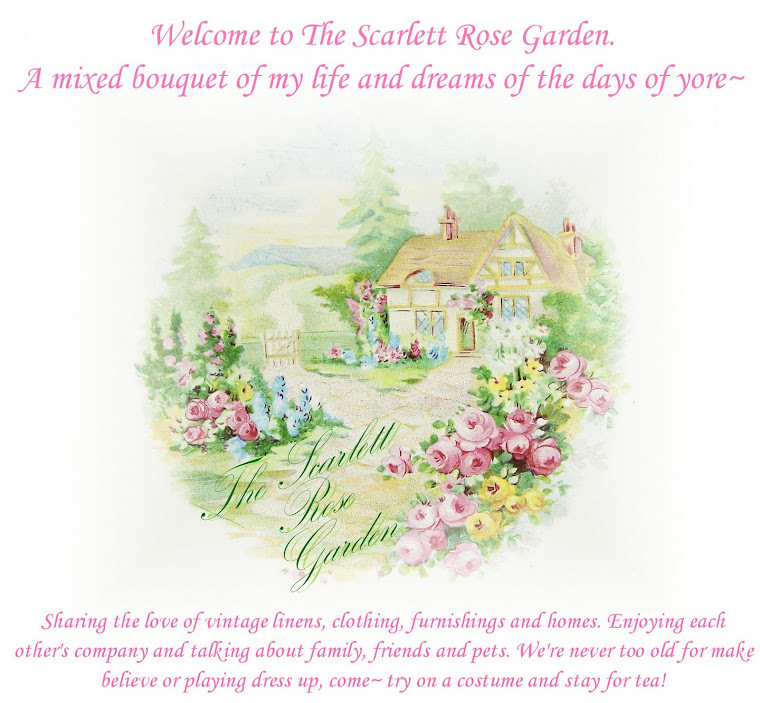 The Scarlett Rose Garden: Cherries Jubilee! We had a wonderful cherry harvest this year. The tree started to put on it's show in May. These are tart little cherries, just right for pies! Click to enlarge for full effect! Ooo, click me, click me!! First day of picking! Here's Kevin, his sister Joyce, and Nova. 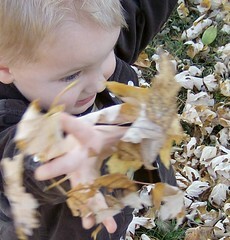 Actually, I think Kevin had already picked some before this, but I'm not counting it as there is no evidence, lol! These were barely ripe but we had to stay on top of them. The birds certainly were! I love this bowl. I think I got it at an auction. Before we new it, it was pickin' time again. Oh, seeding cherries is the PITS!! I never wanted to see another cherry again at this point. 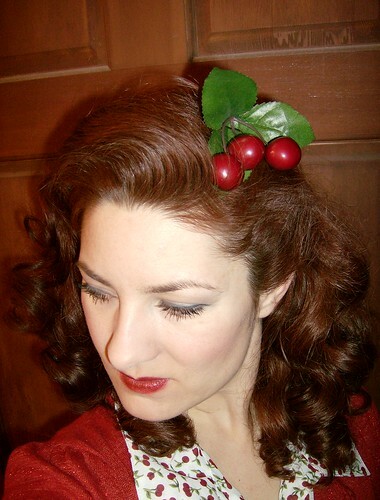 Nothin' like retro red cherries! I should dress for the occasion! A favorite vintage inspired dress from Charlotte Russe. $11.00! 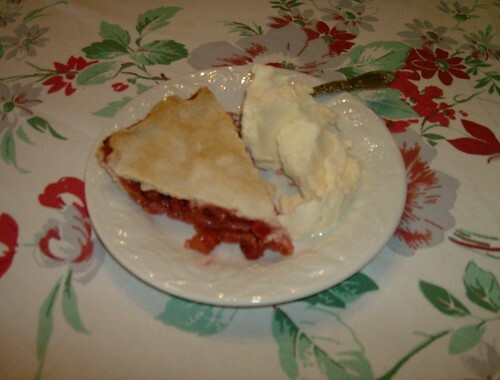 How 'bout some cherry pie? Now I must admit, these two pie pics were two separate pies made on different days! Like to try some dried cherries? These remind me of Craisens. They're great in salads. Some were dried plain, and some were soaked in Tuaca first~ Those were good for snacking! Or perhaps I could interest you in some cherry crisp? 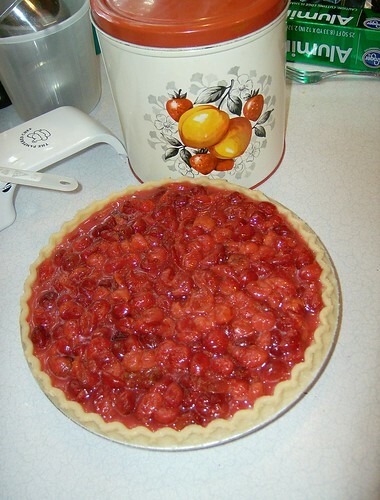 My pie and crisp recipes are from the good ol' Better Homes and Gardens cookbook with the red gingham cover. Sometimes I make the crust, sometimes I buy them. Click to see the little dish, it's a fave of mine. I love it because of the black and white striped "ribbon"
Cherry smoothie anyone? I didn't get a photo of ours, but this one sure is cute so it will suffice! Life is a just bowl of cherries, hope you're making the most of it! Oh, how delightful! Everything looks positively delightful... the fun of picking, the treats you made... and you look gorgeous in your outfit! So cute! Okay wow, that's a whole lotta cherries! But they didn't look ripe enough to be nice and sweet! What the heck is tuaca? Never have heard of that. I love love love that vintage dress you were wearing, and the cherries in your hair! You've even got that 1940s, looking to the side post down perfect! We have a Charolette Russe down the street,I may have to look for that dress. So many cherries,I would be in heaven. I will eat so many sometimes,I'll make myself sick,lol. By the way,I tagged you on my blog,please have a look. Yummy post! Do you have a cherry pitter...pops the pits out and drops it into a container for easy disposal! Please, tell us how you did your hair so cute! Every thing looks delicious and I was being stubborn about not clicking on the pictures to enlarge them, but I gave in towards the end and WOW!!!! Cool pictures of the trees up-close. Nice outfit too! You are a great bargain hunter! Ok, I'm coming to get some cherries.....great post! Thanks! YOU are such a flash back girl! I love the dress, shoes and sweater! That cherry cobbler looks yummy! How do you stick to your diet?! LOL! You look so cute in your vintage cherry dress! Those cherries look so yummy! My mouth is watering. And then cherry pie and cherry crisp, oh my!!! So delicious. And aren't you just too adorable in that cherry outfit! I love all those cute clothes you find and they suit you so well! I have never seen a cherry tree before! Thanks, for the pic's. All your deserts look yummy and your outfit is soooo cute! Oh I love cherries! We used to have cherry trees growing up and would spend hours picking them before the birds could!! I made my first cherry pie one year and as we all were half through our pieces my Dad noticed there were worms clear through it!!! The thought still grosses me out!!! No wonder the birds wanted them so bad!! Your food looks so good you are making me hungry!!! PS I LOVE LOVE LOVE THAT DRESS! YOU sre such a cutie!! Lovely cherry day.... and lovely lady! Okay, so now the Neil Diamond song "Cherry Cherry" is in my head, LOL. Looks like a grand time cherry picking and those pies look de-lish! Have to say it. 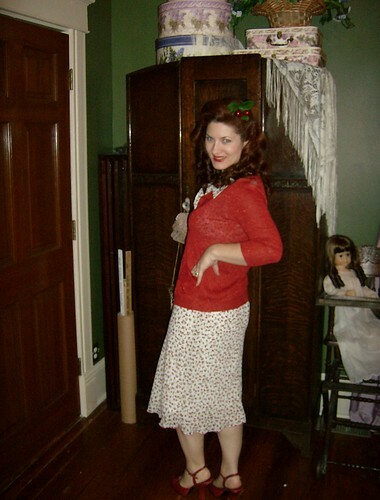 You look great in your cherry vintage dress, shoes, sweater and the piece de resistance? The cherries in the hair. Love it! What a fun cherry-licious post. 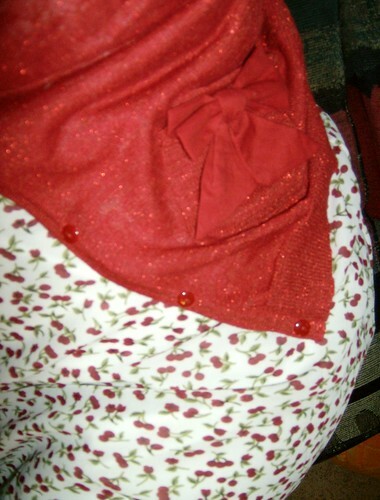 The cherry pie looks delish and the cherry dress is very cute and sweet. Love the shoes and the cherries in your hair. I love your Blog. I just bought cherries today ar our Piggly Wiggly! They were premium price too. I love your dress and the music was so much fun! Thanks for the time on that cute post.